You don’t just want to recline. You want to recline in high design. Wrapped in a fabulous black faux leather upholstery, the Kempten reclining sofa set with 42″ high backs is everything you long for—and then some. Ultra clean lines, subtle curves and sumptuous comfort make it a sight for sore eyes and tired muscles. 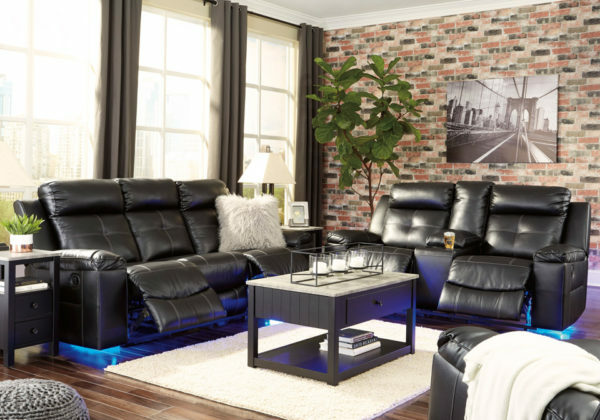 Here’s the showstopper: blue LED lighting along the sofa and loveseat bases for a movie theater experience enjoyed from the convenience of home. 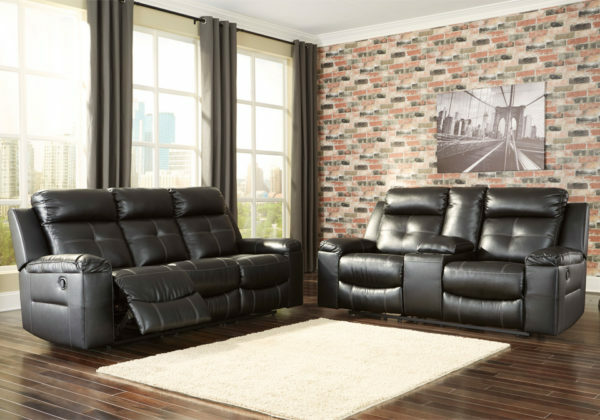 *Sofa set consists of a reclining sofa and reclining love seat. Frame constructions have been rigorously tested to simulate the home and transportation environments for improved durability. Components are secured with combinations of glue, blocks, interlocking panels and staples. Stripes and patterns are match cut. All fabrics are pre-approved for wearability and durability against AHFA standards. Cushions are constructed of low melt fiber wrapped over high quality foam. Features metal drop-in unitized seat box for strength and durability. All metal construction to the floor for strength and durability.